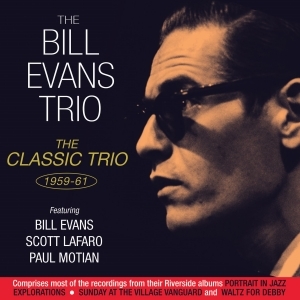 Bill Evans was, according to the New Grove Dictionary of Jazz “one of the most influential jazz musicians of his generation”, and he was certainly one of the first to embrace the approach of a piano, bass and drums jazz trio performing as an integrated entity rather than an a virtuoso pianist with accompanists. It was with this particular trio, featuring Scott LaFaro on bass and Paul Motian on drums, that Evans found perhaps the most quintessential expression of this technique, with recordings that have been hailed by critics as some of the most innovative and brilliant of their time. He put this trio together soon after performing on Miles Davis’ “Kind Of Blue” sessions – Davis said of Evans “The sound he got was like crystal notes or sparkling water cascading down from some clear waterfall”. This great-value collection comprises most of the tracks from four albums released featuring this trio (there was insufficient space in the 2-CD format to include the entirety of the LPs) – the studio albums “Portrait in Jazz”, recorded at the end of 1959, “Explorations” from early 1961, and two live albums “Sunday at the Village Vanguard” and “Waltz for Debby”, both comprising performances at the same Village Vanguard shows in June 1961, less than two weeks before bassist Scott LaFaro was tragically killed in a car accident. It’s a thoroughly satisfying and enthralling collection of music, giving a genuine insight into Bill Evans’ unique qualities as a pianist and bandleader.